This sounds MUCH better than last year’s. Is it henna or chocolate? The best anniversaries to celebrate! Very cool tattoos too. I remember that! (In fact, believe it or not, I think about it at least once a month… I’m weird.) Please tell me you were tattooed in chocolate! Yes, a sense of humor is key! okay, so…color me silly, but, it looks like dave looks at this whole “event” a bit differently than you do…and bit more simple….but, you….you are such a romantic!! 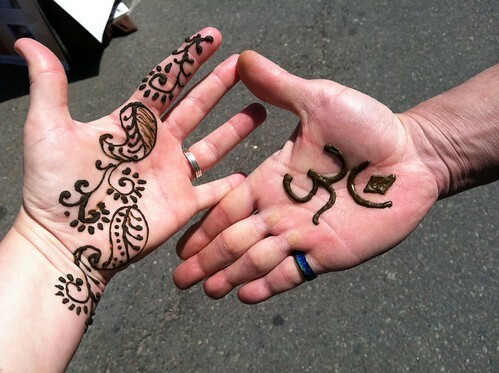 and truthfully…i have always wanted to henna something…it just looks so cool. Love it!!! your henna looks beautiful. is that om on dave’s hand? So cool. I remember this event. You two are lucky to have each other. I love the photo and your great attitude! Yea one year down! So you got henna and he got…what is that? I love the henna. Janet, thanks for visiting me. Your blog is really making me feel I’ve got company!! Henna is beautiful. I’ve always wanted a henna tattoo. I need to read your blog more often! Henna good! Dave amazing! You sublime! Knowing you are both happy, divine! It is such a privilege to get to peek into a love story.